Sonora government officials say they are clearing up problems left by the previous administration in preparation for releasing more funds for the construction of a cruise ship home port in Puerto Peñasco. 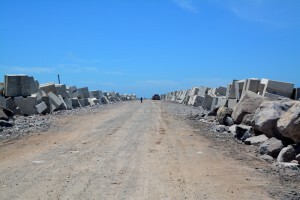 Construction of the facility, which consists of a one-kilometer jetty, terminal buildings and a pedestrian walkway at Sandy Beach, was halted by the new state government which has claimed the previous one had not met federal government reporting requirements. It is one of many claims made by Institutional Revolutionary Party Governor Claudia Pavlovich regarding her National Action Party predecessor, Guillermo Padrés, who is under investigation in connection with missing funds. But a meeting last week in Puerto Peñasco, was given assurances that Governor Pavlovich and the Federal Government, which is funding the port, are onside. Work was forecast to resume within 30-60 days. The home port also came up last week at Tianguis Turístico in Guadalajara, where the coordinator of the state's Tourism Development Commission said the project would be "transcendental," bringing cruise ships that would serve the northwest region, the state of Sonora and the country as a whole. Antonio Berúmen said cruise lines such as Carnival, Holland America, Royal Caribbean and Princess have expressed interest in the port. The market for the port extends beyond Sonora and into Arizona, California and New Mexico. Its construction cost was estimated a year ago at 1.4 billion pesos, or US $93 million at the time. Construction began in 2013 but several delays have slowed things down. It had been expected to begin operating during the first half of this year. In 2011 Mazatlán had been under consideration as the site of such a home port, but the plan was scotched after an upturn in violence. Given the importance of Puerto Penasco as a tourist destination, the Government of Sonora will do what is necessary to rescue and further construction on the cruise ship Home Port, reported Ruben Dario Araiza Salazar, Deputy Income Secretary of the State Fiscal Office. Araiza Salazar stated per instruction of Governor Claudia Pavlovich Arellano, they are pursuing important steps in Mexico City with respect to the project. Clearly, he assured, the intent is to correct anything that may have happened in the past that led to delays in federal public investments so that work on the Home Port may resume fully, and as soon as possible. He underscored this is one of their priorities. He detailed problems to the project arose from the 2013 period, which were not addressed by the former administration. He noted this similarly occurred with many other projects in the state as well. The Sonoran Deputy Income Secretary remarked state finances and income were in a state of chaos when the new administration came in. However, they have set to the task of rebuilding and correcting items that were not done appropriately in order to move forward the projects that are a priority for Sonora. Araiza Salazar stated he is fully aware of the current economic situation in Puerto Penasco and how it has been affected due to dependence on the US economy. With this in mind, he hopes via his role in the State Government to support any infrastructure projects Puerto Penasco may have. This is precisely the case with the Home Port, he emphasized, as it is a project they will continue to promote, just as many others that are fundamental for Sonora. ¡Viva Mexico! The exclamation points represent arms thrust into the air in utter bewilderment. 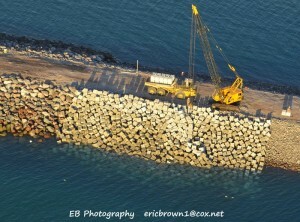 Our home port construction progress is facing yet another delay. This one even more bazaar than the rock quarry not producing the size stones needed as originally planned. This time, although, thankfully, just another delay is caused by a lack of proper reporting by the former governor's office. Since the federal government is doling out the funds at the rate of 300 million pesos pretty much annually, they, rightfully, want to know exactly where the funds were spent during the previous construction year before handing over the coming year's funds. It seems this totally justifiable requirement by the feds was, as we understand it, completely ignored by the former governor-at least that is to whom the blame is directed, and we should have no reason to disbelieve it since that governor allegedly committed a host of other corroborating sins before vacating his office, which, we understand, is occasionally the "departing politicians' way" by Mexican tradition. That said, our new governor, Ms. Claudia Pavlovich, is very supportive of not only the home port project, but of Puerto Peñasco as a lucrative world class destination for international tourism, and she is willing to do "whatever it takes" to support the city in every way possible to prepare for the future. Thus, the paperwork is being prepared so the feds will release the funds as soon as possible. According to the port engineers, the funds could be released and construction resumed by as early as the first part of March. Maybe we should give it until the end of March and not freak out if it stretches into April. During our walk to the end of the 730-meter jetty (aka pier; aka breakwater), Wendy Winzer, Project Administrator, explained that they only recently learned of the funding delay and used their time before they shut down to catch up on final cube placement and surface grading of the finished section of pier. Those huge 10 ton cubes are stacked three high in various angles to make a pretty steady 3-4 meter wall on each side as we walked. When we reached the end of the pier, Wendy pointed out that the dock construction company is still working with what is left of their budget. She explained that those angular shaped tubes coming out of the sea will make the foundation for the walkway between each end of the dock and the ship tie down platform. Once they finish that portion they will begin sinking the large pilots that will be used to form the concrete columns that will support the huge dock. During our journey we were joined by two Naval commanding officers who were conducting their monthly inspection from which they prepare and submit a report that eventually ends up supplying information for the world wide oceanic data base that monitors all changes to shorelines around the planet. The whole scene at the end of the pier was quite postcardish, with pelicans diving, dolphins dancing and a panga of fishermen taking advantage of the rich new abundance of edible marine life newly residing amidst the nooks of rocks and cubes along the breakwater. This impact study is aimed towards helping our readers understand more fully what a cruise ship departure and arrival port will mean to our little slice of paradise by the sea. In past articles we have covered statistics based on known actual expenditures by cruise passengers and crew members, proven arrival and departure patterns of cruisers and many other details about this special tourism market, all of which have painted a rather dramatic scenario for unprecedented growth in our community. We've shared about the importance of a welcoming atmosphere to cruisers who are all used to being pampered by the cruise lines from the time they purchase a ticket to the time they disembark at the end of their cruise. We know that all the city and its citizenry have to be sure of is to make every cruiser feel welcome, and make sure we have the service and supplies that meet the quality and availability they are accustomed to receiving. On a few occasions we have devoted stories to rumor control when facts do not support what is believed by some readers, either through a misunderstanding or due to a distortion of the facts. This is one of those blogs. In our last post, Part XVIII, we related a conversation with Wendy Winzer, Project Administrator for Port construction, in which she let us know that work on the new pier would taper off during the Christmas holidays due to so many workers wanting to take their vacations during this time. As predicted, it seemed their last job was to complete anchoring the light buoys that warn boats and ships where the jetty is located and where it will be when finished. They are easily seen for miles around. Wendy also informed us that bids had been accepted and construction was underway to build the docking platforms where the ships would be tied and anchored. This construction, too, she correctly predicted would be affected by the holidays. Just a couple of weeks ago, a small article appeared in print that stated the federal government had cancelled the contract of a construction company involved in the building of the pier. This seemed to spur the rumor that the home port project was cancelled. The fact is that there were two companies contracted to build the dock that will be attached to the pier. The federal government decided that one company would be sufficient to construct the dock and cancelled the contract of one of the companies. The dock construction is a separately awarded contract and independent of the major pier construction that was initially awarded. The construction of the cruise terminal is yet another separately awarded bid. The construction of the terminal put out for bid and has been awarded, so we can look forward to that activity beginning in the new year. As the new year unfolds, look for what will seem like one major construction project, which is actually three different projects, operated by three separate bid awards. We hope this clarifies any questions about the future of our highly anticipated cruise ship home port. We welcome and encourage inquiries from anyone looking for clarification on any phase of this important and ambitious endeavor. We will seek and find the facts when available to satisfy your inquiries. In part XVII of our series about the Home Port and its impact on the future of Puerto Peñasco, we looked at how closely our little slice of paradise by the sea fits into the most popular preferences of cruise passengers around the globe. For example, surveys of over 23 million cruisers last year revealed that 75% of passenger expenditures were made in four categories: 1.) watches and jewelry; 2.) shore excursions; 3.) clothing; and 4.) food and beverages, in that order. Detailed statistics the cruise lines have been gathering from passengers for nearly a century serve as an invaluable tool especially for a new destination in its preparation to host cruise passengers, in our case, before and after they cruise. As a home port, we get them twice, and for several days, unlike any of the other ports of call in Mexico where they will spend just hours visiting. Properly used, those statistical details can literally launch a business for anyone interested in formally serving the cruise market. As a tourist destination already, our beachside village is accustomed to serving visitors from all parts of the U.S., Canada and abroad. We are experienced in serving driver traffic from nearby states. In the beginning, until the airlines receive landing rights and choose the airports from which they want to bring passengers to our international airport, driver traffic will be our main cruise market source. Sort of like "more of the same old, same old" except on steroids. Therein lies the value of knowing as much as we can about the specific cruise market and where we need to ramp up service, supplies and transportation once they arrive and get their autos parked for the week. Taking care of basic marketing and publicity needs is so much more defined when we know who is coming, when they are coming and when they will be returning to our port. There exists abundant and detailed data about how to prepare for such an influx of visitors and the in depth statistics of what they will want and need, what they will participate in during the average day and a half before the depart and about the same time after they return from their cruise. You can get a better idea of how these statistics from the cruise lines can help you launch a market specific business by reviewing past articles in our article series from Part I on. So what's been going on with the construction of the home port during the last month? If you've traveled the Cholla Bay road enroute to Wrecked at the Reef, Mare Blu Restaurant or to historic JJ's Cantina, you've seen the concrete plant area on the right where they pour those one and ten ton cubes and stack them so neatly in gigantic rows while they wait to be loaded onto the 18 wheelers for placement in the sides of the pier to stabilize the smaller rocks that were poured to build the jetty up above the high tide level. 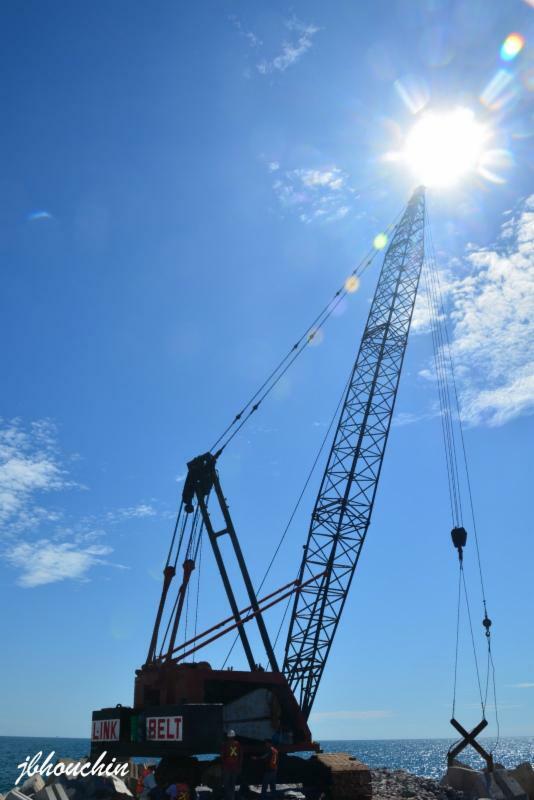 According to Wendy Winzer, our cooperative contact and Project Administrator for pier construction, the weather has allowed them to continue smoothly this month. They have also completed placing the twelve floating buoy lights in the water along the pier and its future pathway. They have kept the six existing lights on the jetty for added caution. 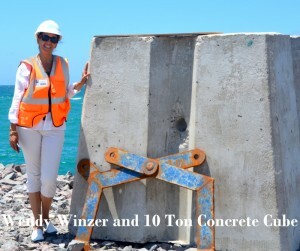 "We are at the 720 meter mark and cannot estimate when we will reach the turning point where the jetty will begin its journey to the southwest for the final 411 meters, but the other construction company who won the bid to build the cruise ship docking platform will begin building the pilots for structure any time now-it's pretty exciting," Wendy explained. 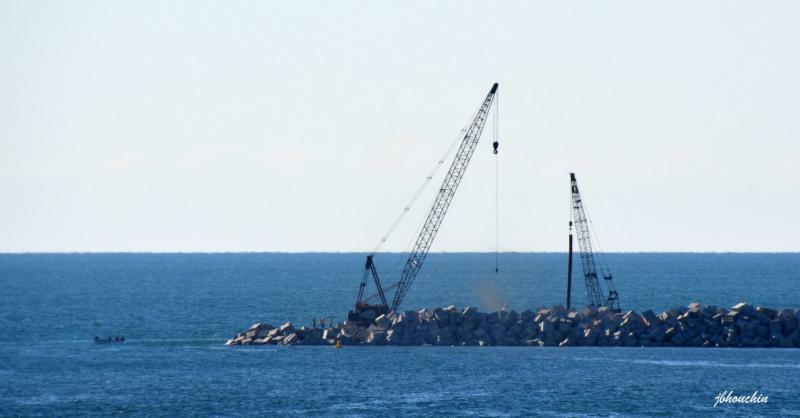 "We've set up a schedule to blast the smaller rocks from the quarry on a monthly basis now to keep a steady supply rolling down the jetty," she added. Wendy also reminded us that December is a month when many of the personnel take holiday vacations and as such, work on the home port will be light until the first of the year. And, Happy Holidays to you, Wendy! Even as the strong and persistent summer winds were playing havoc with the home port construction schedules, worldwide cruise news was full of positive growth numbers and valuable statistics showing increases in almost every segment of cruise passenger activity from participation in shore excursions to individual spending at port departure points, ports of call and port disembarkation points. In addition, Carnival Cruise Lines completed construction on some major pier investments pretty close to home, well, Cozumel, same country but on the opposite side. We have previously discussed in some depth what we should be learning from the detailed statistics the cruise industry has a history of following for decades. Statistics which they have collected religiously and used to create phenomenal, consistent growth in passenger traffic and astronomical passenger satisfaction figures. Even after more than a century the cruise lines still study-and learn from-their statistical information gathering. This information directs their every move, from immediate adjustments to future ship builds. It seems like a no brainer,then, that we can gain valuable knowledge to help us prepare for our entry into this lucrative, affluent, even glamorous market. For example, the fact that 75% of passenger expenditures were made in four categories: 1.) watches and jewelry; 2.) shore excursions; 3.) clothing; and 4.) food and beverages, in that order, should command the attention of business interests in any of those categories. Retail stores and gift shops should realize that the real money is in handling real jewelry and a variety of high quality watches just for starters. Let's break down just one of those categories, saving the others for future reports. The latest stats shine brightly and specifically for local tour operators, practically designing their tour products for them. Shore excursions were the most popular category among the above mentioned four. Over half (53%) of all passengers purchased a tour and tour operators received an average of $44 per passenger directly from passengers and cruise lines. We also know that the excursions offered had better be well designed and highly service centric because shore excursions received the highest score of all visit attributes (8.3). So we know exactly what they are expecting from a tour experience. We even have statistics that tell us which excursions rated highest: Those involving History and Culture. It's like they are playing right into our strongest suit here in Puerto Peñasco! And the clincher? These stats are from 23.6 million passenger shore visits during the survey period. On the 15th of October we took a walk with Wendy Winzer, Home Port Project Administrator, to the end of the pier, which is now at 720 meters in length, and back. Just another 220 meters to go before it makes the WSW turn for the final 411 meters. The contracted docking company will begin anchoring their independent dock at about 140 meters into the turn. While we were walking Wendy explained that they are waiting until more small rock is blasted from the quarry which is supposed to be taking place before the end of October. In the meantime, they have renewed pouring the one and ten ton cubes anticipating the need immediately after the small rocks are poured. For the next week or so they are continuing to retrieve and re-position all the rocks and cubes that were displaced during the high winds of the last two months. You would think that in her job, a walk to the end of the pier would be a rather routine activity, but Wendy exuded enthusiasm as she described the increased marine life and the exceptional skills of the front loader operators. "These guys are artists as they operate these huge front loaders". When they are done with the small rocks the jetty looks as smooth as a wall, then they assist the large cranes by balancing the great cubes in their loaders and place them in the exact position to weigh the rocks down until they settle. "We have seen small sharks darting among the rocks and the divers seem to discover new species of fish on each dive that have taken up residence in spaces between the rocks and cubes", she was excited as she spoke. "Even the banana boat operators are dragging their passengers slowly up close to the jetty to give them a bird's eye view of the progress." As we stood at the end of the pier, sure enough, there's a banana boat free floating about 30 meters east with a banana-load of kids. They weren't looking at the pier, though. They were enthralled with a large pod of dolphins dancing their way around the end of the pier not 20 meters in front of our position. This time Wendy wasn't the only one excited. 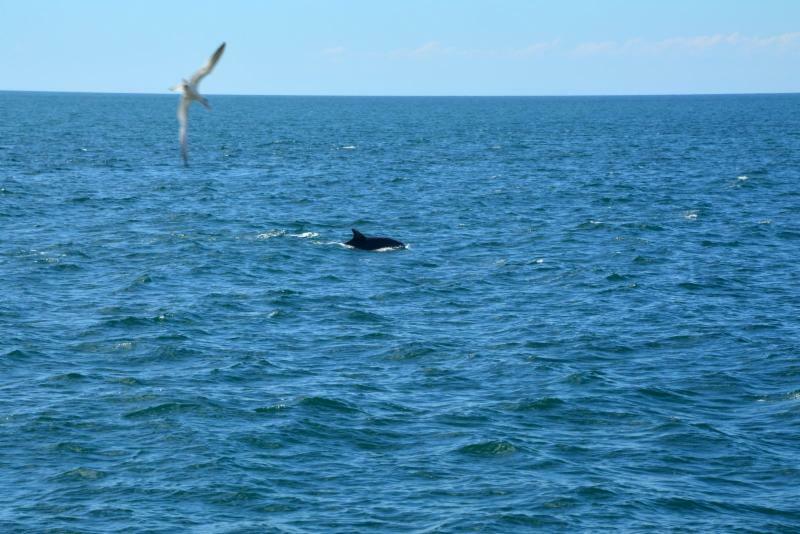 Out there, over half a mile from shore the wildlife and marine life activity is astounding. Dozens of species of seabirds, large fish of unknown species, at least to this writer, swimming just inches below the surface of an obviously clearer sea this far out. The dolphins added to the color and art of the scene as they merged around the end of the jetty and headed toward the beach, feeding on the new residents who had found a home among the rocks. As their lunch dispersed the dolphins continued toward the point at competition hill. "Sights like these make all the hard work seem like a pleasure to me," said Wendy as we headed back to her trailer/office. Oh, yes! The construction process on the Puerto Penasaco Home Port continues and work is ongoing 7 days a week, weather permitting. At this time, they are at a point where there really isn't a lot of new information to share so, this month, I am going to take a break from our regular monthly series and I will share a recent article put out byTucson.com and the Arizona Daily Star. The first part is shared here to get your attention and you can click the link at the end to read the entire story. 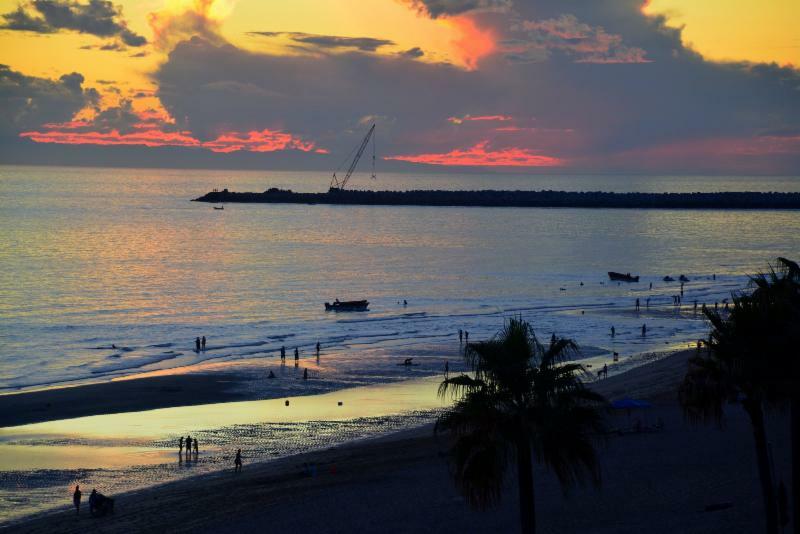 PUERTO PEÑASCO, Sonora - Hopes are high that a new mayor and the construction of a cruise ship home port will speed up the economic recovery of "Arizona's beach," where the Great Recession crippled a once-booming real estate market and tourist destination. The town, also known as Rocky Point, is already seeing an increase in tourism, officials said, with about 2 million people visiting in 2014 and a projected increase of about 20 percent for 2015. While the beaches may be getting more crowded, the most visible sign of progress is a large crane and heavy construction equipment at the western end of Sandy Beach. 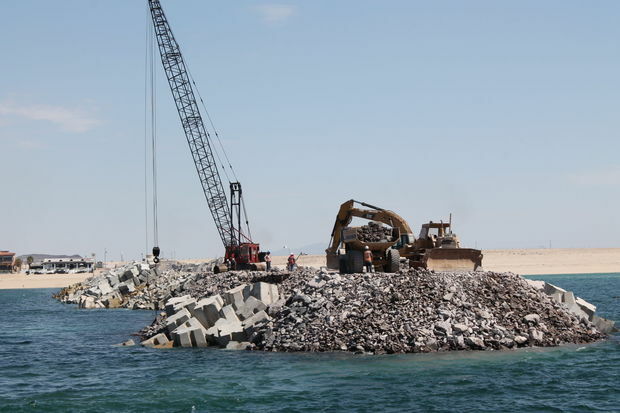 Workers spend their day dumping rocks and adding enormous concrete blocks to the breakwater that eventually will allow the construction of an almost mile-long dock for cruise ships. Although there are several ports where cruise ships can stop while visiting Mexico, Puerto Peñasco will be the country's first home port, not only a stop but a point of origination. The port's proximity to the United States and a growing tourism market in Mexico make it a perfect location, officials said. "The potential market for the Puerto Peñasco home port is estimated to be about 1.9 million cruisers," said Diana Nieves, marketing manager at the port administration. "The cruise industry is growing 7.2 percent per year and the Sea of Cortés is one of only two routes that have yet to be serviced by the industry." The other route is Cuba, she said. So far cruise liners have been receptive and open to the possibility of another home port and a new route, but they are taking a wait-and-see attitude before making commitments, Nieves said. Right now her job is to keep the city alive in the minds of the big cruise companies and educate travel agents, the biggest source for cruise bookings, about what the area has to offer. 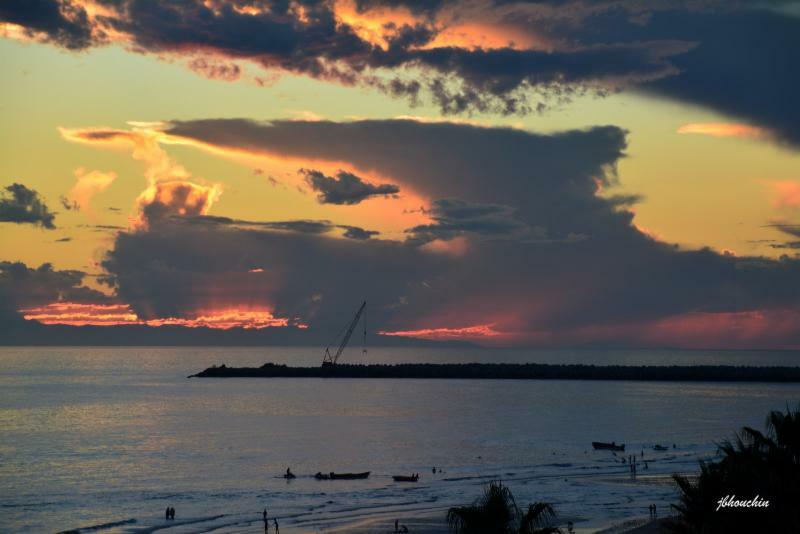 "Outside of Arizona or the Southwest, Puerto Peñasco isn't as well-known as say Cancun, Conzumel or Los Cabos," she said. "Even with some travel agents, you have to say, 'OK, here's Los Cabos, here's San Diego, here's Puerto Peñasco.'" Since our blog on the Home Port, Part XV, last month, the weather has controlled fully one third of the construction time. High winds causing sizeable waves out towards the end of the jetty have prevented the heavy equipment from pouring the smaller rocks needed as a foundation for extending the jetty, which in turn prevented the cranes from packing the rocks with first the weight of the one ton cubes and then the ten ton cubes. 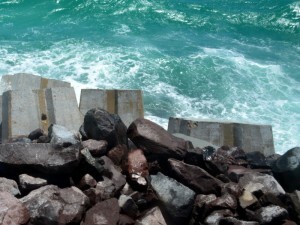 The result of such huge waves and subsequent undercurrents have pulled the unprotected rocks away from the jetty which brings the need for a heavy front loader to literally build a path along the side of the jetty and shovel the rocks back to the sides before the concrete cubes can be placed to anchor them down. The winds have been strong enough to prevent even the large cranes from lifting cubes into the wind without threat of a disaster. Our monthly walk with Wendy Winzer, Project Administrator this last week covered the entire length done so far, 680 meters out from the shore, and happened to be during one of those windy days. Be assured that what you see and feel from the shore is just a breeze compared to what is going on out there. 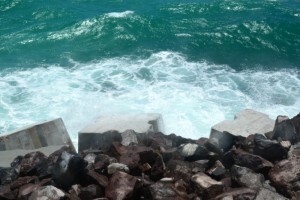 As these photos indicate, the waves were large enough to bury the huge ten ton cubes when they crashed against the jetty. 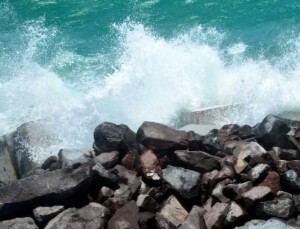 When you see these huge concrete cubes being jostled about by the force of the sea, it is easy to understand how rocks and even the one ton cubes can be pulled away from the jetty during those days. Bottom line here is that a halt in pouring rock due to this kind of weather means much more than just continuing when the winds die down. It means having to retrieve all the rock that was pulled away from the jetty and repack it back along the sides, then support it while the giant cranes carefully place the cubes on top to hold the rocks in place until they are settled. 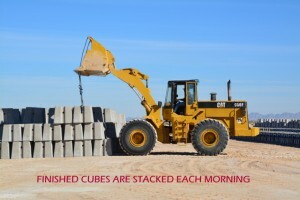 They had to halt the onsite concrete plant operation because of not being able to place the cubes due to weather. However, they were able to resume making cubes again this week. All was not lost during the adverse weather conditions. The crew took the time to perform heavy maintenance on the six giant cranes and position the front loaders to begin repacking rock when it is safe to do so. When asked about the dock construction, Wendy said that the company contracted to build the cruise ship dock onto the finished pier is already in the process of constructing the large pilots that will hold the dock in place. Once the pier has reached a length to where the dock can be attached, the dock builders will use a crane on a floating barge to install the pilots in the sea floor. 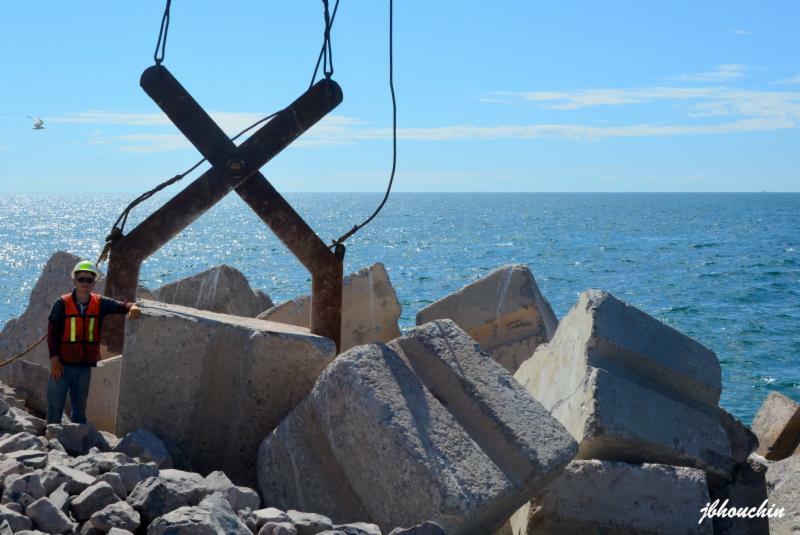 Infrastructure in and around Puerto Peñasco will take on more importance as the projected completion dates for the home port construction phases become more predictable. There are at least three phases to the home port construction project and we are still waiting for start dates on two of them, so completion dates are impossible to project. After the pier reaches the planned length then construction of the docks will begin. That phase is under separate federal contract with another company. The terminal construction is under another federal contract with yet another company. Until we are quite a bit further along, and the new administration gets settled in and begins to reveal their position on creating the overall infrastructure there are just too many pieces of the home port puzzle not connected to think about priorities. It took all the foregoing to justify an opinion that we have reached a lull in our series which could last through summer. Therefore, with the splendid photography of Eric Brown, we will follow progress of the home port letting his pictures speak their “thousand words”. We will also stay in close contact with our friend and pier construction project administrator, Wendy Winzer for any new information she can provide. Of course, we will continue to attempt making headway into the new city administration, specifically the Mayor’s office to learn what we can as to how they are thinking in terms of launching infrastructure activity. Our walk with Wendy this month was indeed a short one with limited new information, though she did share all she had with enthusiasm. Last month she had reported that to date through May they had poured 20,000 small one ton cubes and 4,500 large 10 ton cubes. They had placed 7,400 small cubes and 1,800 large cubes on the jetty (pier). Thanks to their increase to six giant cranes last month which are strategically placed from the pier to the cube field, the ability to place cubes on the pier will increase. 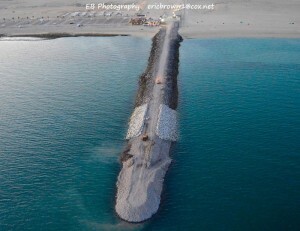 Inclement weather last month hindered progress on lengthening the pier which was at 630 meters by month’s end. They were still able to continue building up the east side with 10 ton cubes to protect the small rock. “As it stands we have still added 50 meters in length to the pier, bringing it to 680 meters,” reported Wendy. 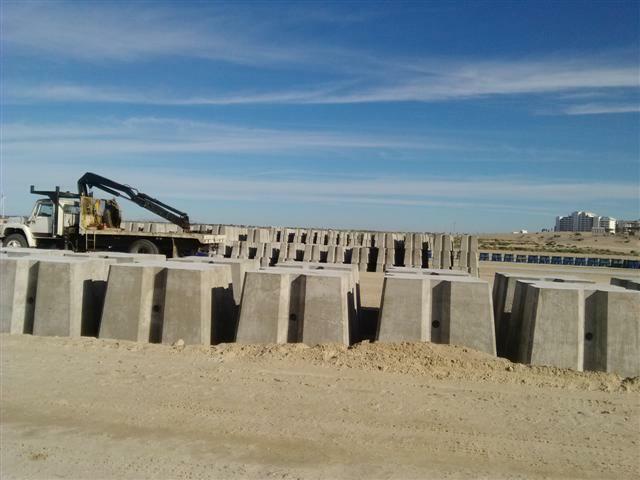 Installation of the on site concrete plant adjacent to the cube field increased their capability to pour more cubes each day. This month they have averaged pouring 300 small (one ton) cubes and 100 large (10 ton) cubes daily and have successfully tried to place the same amount on the pier each day. We look forward to hearing from Wendy further during July. 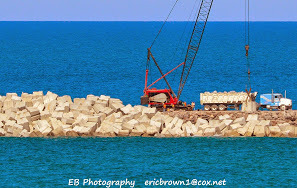 We also thank Eric Brown (EB Photography) for his historically important photographic journaling of the home port construction progress. As we publish the 14th consecutive issue in our Home Port series, we enter the realm of complexity, conjecture, projection, opinion, even mystery; yet it is a realm we must address from its most critical aspect and in some detail. That is, of course, Infrastructure. We've broached the subject in previous issues of this series, but in nowhere near the detail it deserves, nor with the facts from reliable sources as to plans. Now, as it happens, we must wait in limbo until after the June 7 election to sort through all the changes that are sure to take place with the new administration, even if it turns out to be the same party. One thing we know for sure is that the infrastructure planning and scheduling is a long, involved list with varied priorities. Adding the fact that federal funds are being used, it is easy to imagine the nightmare of paperwork that must be overcome. Many argue that this alone makes even the year an inaugural cruise sailing might take place impossible to predict. How does one counter that argument? There are actually several scenarios that could take place to make the argument that predictions are not only possible, but could be surprisingly more accurate than one might think. One such scenario would be that, as the home port gets closer to completion, our municipal leaders become more excited about the potential for revenue that cruise markets will represent for the city and cause them to strengthen their emphasis on creating ways of expediting the more challenging aspects of infrastructure requirements such as those heretofore seemingly unanswerable needs for more water and plausible sewage and waste disposal. Another scenario could be as simple as the newly elected officials wanting to establish their reputations as "doers". And the biggest possibility just might come from the cruise lines themselves. We've been assured that talks have been underway with the cruise lines even though one has not been selected or has not decided to launch from our port as yet. We have no published proof of any such talks, but some actions by the pier contractors tend to substantiate communication with the cruise lines. For example, it was a result of suggestions by the cruise lines that the length of the pier was extended to reach deeper waters to accommodate larger ships. When the cruise line is confirmed to operate from our home port, the motivation and excitement at all levels will reach new heights and infrastructure that has not been completed will be expedited for sure. This is based on historic data from cruise lines in other ports making sure all infrastructure is completed prior to their relocating a ship to our port even if it involved them getting directly involved. Everything that goes into designing and establishing a completely new itinerary is a monumental decision and project of incredible expense and risk on the part of a cruise line and they make that clear from the beginning, as well as keeping close tabs on the progress of all phases of infrastructure installations to completion. 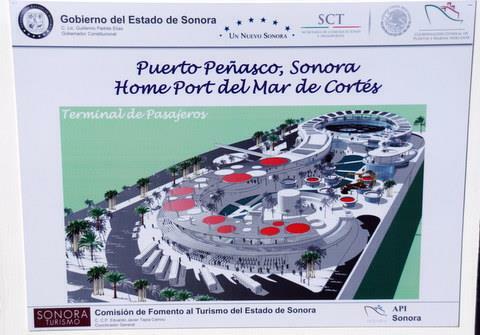 We will be going straight to the sources and reporting to you in future issues of our Economic Impact of Home Port on Puerto Peñasco with new and detailed information on the plans and schedules for completing all the infrastructure needed for a home port destination to serve this lucrative industry. We love getting updates every month straight from Wendy Winzer, Project Administrator of homeport construction. This month Wendy has been very busy dealing with the arrival of new giant cranes that now total six, placed between the jetty and the cube field. She has also worked with the independent company that has installed a concrete plant adjacent to the cube field which has increased the capability of pouring more cubes every day. Wendy has also dealt, "with several weeks of strong winds and high tides which have made it more difficult to pour rock, however we continue dumping the small cubes and have started placing the 10 ton cubes on the east side of the jetty to protect the small rock," she tells us. To date they have poured 20,000 small one ton cubes and 4,600 of the big 10 ton cubes. They have placed 7,400 small cubes and 1,800 big cubes on the jetty. The windy weather last month has hindered significant progress on lengthening the pier, but they were still able to build up the east side with the large cubes. Wendy was excited to say, "We are on track on our part with the construction of the jetty, still looking at the end of 2016. The dock construction is under separate contract with another contractor and I don't know at this time how they are doing with their own schedule." She added, "We are moving forward, with high expectations for the June 7th State Government elections!" Just when we thought cruise ships couldn't get any more humongous, luxurious and fantasy-laden (like, where are they going to dock those veritable floating cities? ), the latest builds reveal that new technology and creativity can combine to blow the mind even more than we thought possible. Hugeness continues with the size of mega-vessels now inching past each other by meters in length, square footage of cabins, total capacity and, oh yes, amenities, activities and entertainment. From water slides that spiral ten decks downward into giant champagne glass bowls to zip lines that traverse hundreds of meters across the ship-that's right, hundreds of meters as the latest ship just launched in Royal Caribbean's Oasis class of mega ships is the Harmony of the Seas, the largest cruise ship in the world at 362.15 meters in length (395 yards-1185 feet) which also boasts entertainment that includes full Broadway shows, bigger than life visual experiences through interactive movable walls to completely robot operated bars and up to seven themed neighborhoods spanning multiple decks with fully operating carousels...and much, much more. Click the link below for a graphic of the first Oasis Class ship, Oasis of the Seas (2.15 meters shorter than the Harmony), that will give you a comparison of its colossal size! These are interesting, fun facts about how high technology, unleashed imagination and seemingly fathomless budgets have taken the cruise experience to heights heretofore undreamed of. 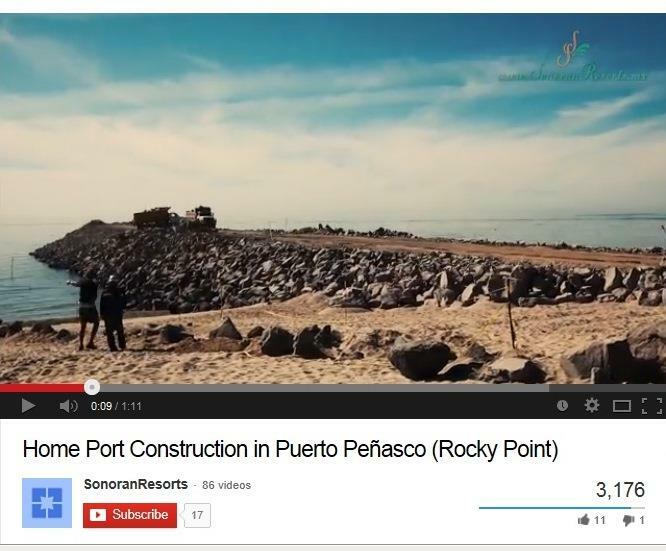 But how do they relate to Puerto Peñasco infrastructure needs and plans? Perhaps they give us a heads up on how much additional attention to detail we should put into the design of that infrastructure; to make creativity a major part of the contractor bid selection, encouraging bids from companies who can best and most creatively include the latest technology in their proposals that result in such things as unique lighting, dreamlike landscaping, signage, building design and every other aspect of the overall needs to prepare for a market of modern cruisers about to board a vessel full of surprising new adventures. Perhaps even more importantly, upon their return, to ease them back into reality so they are still motivated to make Puerto Peñasco their next land vacation choice. Maybe we can't compete with the surreal technology cruise passengers are being mesmerized with these days, but we could possibly give them a pleasant contrast by emphasizing the historic and natural beauty of our part of the "real" world in which they live. Here's the latest from our project insider, Wendy Winzer, Project Administrator of Home Port construction who tells us that the pier has now reached a length of 630 meters. It is taking longer to grow in length since they've reached the water depth of nine meters. They are also still shaping the existing jetty with new rock which they cover with the small one ton cubes so it will all stay in place. They've poured around 13,000 small cubes (one ton size) and placed 6,000 of them on the jetty. There are almost 3,000 large cubes (10 tons) poured and waiting to be placed. 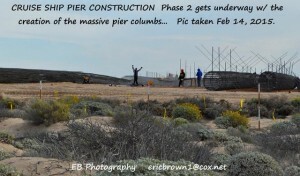 They are expecting an even larger crane in about two weeks that will start placing the big cubes along the jetty. Rocks from the quarry are still being hauled and placed and they blasted Black Mountain again two weeks ago to loosen up more rocks. Wendy also happily informs us, "We have been very busy trying to keep up with our schedule which is going right on track!" Wendy reports that she has been giving several interviews to TV, radio and newspapers. "It seems the word is really getting out there in a positive way, and with a little help from everyone we will try to give our small town a positive hope for the future," Wendy says. As we continue through a year of Home Port Economic Impact studies as they relate to Puerto Peñasco, this is a good time to review some statistics that have been released over the period and, if covered, warrant reiterating to keep us in tune with the sheer size of the industry that is about to take us under its wings of wondrous adventures and imagination. We speak of course of the cruise industry. It is an industry that seems to have done everything right from the very beginning, even though it started without a plan other than to take 241 very deserving, and wealthy, passengers on an extended cruise of the Mediterranean back in 1891. This marked what is officially recognized as the inception of the cruise industry, an industry that continued to grow, contributing to world economies until 1970, the year the industry carried 500,000 passengers, literally slinging it into "Critical Mass", when growth takes on a life of its own, and cruising has never looked back since. In 2013 an estimated 21.3 million passengers embarked on cruises from 2000 cruise ports worldwide contributing $117 billion to the economy and supporting 891,000 jobs paying $38.5 billion in income around the world. Even with only 30 of the world's 2000 cruise ports, North America remains the dominant market with a global share of 55.5%. The U.S. truly drives the world's cruise market, contributing $44.1 billion to the U.S. economy generating 363,133 US jobs paying wages of $18.3 billion. The cruise industry impacted the economies of all 50 US states in 2013. Considering the unstable world economy over the last few years, including in the US, these figures are nothing less than astonishing. And if these numbers aren't enough to float your ship, consider that there are no less than 30 new cruise ships on firm order for delivery by 2020, 17 of which, worth nearly $12 billion, are scheduled for delivery by the end of 2016, that's an investment of more than $250,000 per luxurious cabin! With the industry's fearless foray into spending without limit on developing high technology to bring more incredibly imaginative amenities, experiences and attractions on board these colossal vessels, the scenario only gets more exciting, as we've hinted at in previous articles, and will continue to cover in the future. Every time we look towards the pier, it is exciting to see the equipment traversing territory from beach to sea. Our kind and knowledgeable guru, Wendy Winzer, Project Administrator, tells us that it may look like they are working the pier 24/7, but the crews are actually working the concrete cube site 24 hours a day in two shifts. They are pouring 150 cubes per day using 200 small (one ton) molds and 58 big (10 ton) molds. All the cubes so far are being placed to reinforce the existing part of the pier and no significant length has been added. The lighter colored cubes create an illusion that the pier is being extended. Wendy was pleased, even excited to let us know that not only are the cubes fitting in as they had planned, but marine life is abundant, even during construction, and increasing with the change of the season around the pier. She said, "We get seals, turtles, dolphins, tons of different species of birds and ducks, and many schools of fish." 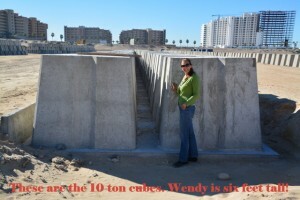 Wendy added, "We now have poured 8200 one ton cubes and 1100 10 ton cubes, of which 2000 have been placed on the pier already. This puts us right on schedule. "The company is doing their best effort in every possible way to be on schedule and meet the intended goals. We do plan to increase the workforce and increase the equipment as needed as we continue pouring concrete cubes, placing them on the pier and dumping rock from the quarry." In last month’s PART X of our monthly series of reports on the impact the upcoming home port will have on the economy of our little slice of paradise by the sea, we hope you may have begun to realize that said impact will be greater, wider, longer, deeper, more angular, higher, more inner and inter-twined, intricately webbed and woven than you could have reasonably imagined . What’s more, as the jetty—all we have to show the world at this moment in time—continues to materialize before our eyes, we shall also continue to share additional, more detailed facts that we promise will grow in mass and complexity equivalent to the progress of the home port project itself throughout its development. As we’ve tried to drill home previously, these facts are available from over 40 years of meticulously kept marketing, service, mechanical, and growth statistics which, arguably, the cruise industry has maintained better and more consistently than any other industry since they began floating humans in luxury from continent to continent. If what we promise tells you anything about the impact we can expect from a home port, it should create a clear and sharply focused image of a Puerto Peñasco future changed so rapidly and radically it could be absent even any of those ceremonious reminiscences of the way we remembered this area as a small fishing village, occasionally conquered by weekend beach addicts of such a fun-loving culture that today we’ve come to love and appreciate. So much accurate and important information—especially in the areas of marketing and customer service—exists that present day vendors and service providers can literally scribe training manuals based on absolute fact, and deliver that training as far in advance of the first arrivals as they wish. This is a really good thing, too, because it gives a home port time to produce a cadre of full service professionals in every related industry that will be called into service from the very first departure. Information stands stocked with colorful, informative accurate information will be available in abundant quantities to help new visitors make good decisions about what they can do while in our port city. Just to make a comparison of how important this seemingly minor service niche can be to a destination, let’s consider that, in place of a cruise departure port as the attraction, we had a wild animal park, a “swim with the dolphins” attraction and deep sea fishing. First, the visitor would be here for an entirely different basic reason, not to take a cruise. How did we get those tourists in town—probably the same way we have for the last several decades—through a weather and economics dependant marketing strategy. Why would they return next year? You may see the issues here. We have questions but no educated, proven answers from which to predict the future decision making on the part of our potential repeat visitors. With a home port on the other hand, we know for a fact, proven over 40 years of marketing studies, that over 60% of cruise passengers use cruising as a means to decide on future vacation destinations. You can’t get much more valuable information than this if you’re in the resort, attraction or food and beverage business. If that weren’t enough, most cruise passengers arrive 1.5 days before the cruise departure and use local transportation, local tour operators, eat at nice restaurants, and many decide to stay a couple of days longer when their cruise ship returns the next week. They decide to bring their extended families along the next time they cruise. By the way, most cruisers don’t cruise every single year (although the trend is developing into that—mainly because cruise ships have become so state-of-the-art comfortable, entertaining—ridiculously entertaining—and amenity equipped, that the cruise ship in itself is a bona fide vacation destination with every vacation activity imaginable. Most cruisers will intersperse a cruise with a land vacation every other year. We’ll list just some of those next month before we dive head first into how far down (or up) the scale of economy just one cruise family can spread their expenditures and revenue. We’ll also discover where a surprising source of completely new-found revenue will be coming from without our city having to expend even one peso! In the midst of all the resumed activity at the pier, we didn’t personally touch base with our fountain of information, Wendy Winzer, Project Administrator. But we did have a meaningful telephone conversation to catch us up on where they’re at with the pier. 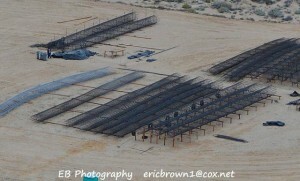 We also want to thank Eric Brown for his great photos covering everything from the cube molds to the giant rebar frames being assembled out in the open space on the way to Wrecked or Mare Blu. They certainly get the point across as to the size of this project! In our Home Port X blog Wendy mentioned they would need a total of 73,000 one ton concrete cubes to complete the need for that size cube. There are approximately 6,000 poured right now. 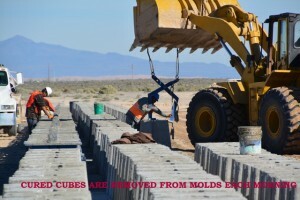 They will also need approximately 8,000 of the 10 ton cubes, of which they now have approximately 400 and are waiting on the arrival of more molds for both sizes. 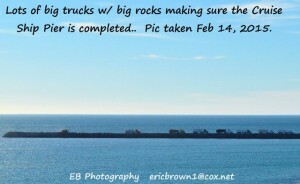 In the meantime, the truck activity you see along the pier involves continued dumping of the small quarry rock (called “Nucleo”). However, things are about to change because the giant crane has finally arrived that will be assembled and able to lift and haul the one tonners for placement along the pier. The other progress made involves the gigantic rebar formed columnar frames which have begun to be assembled and will be placed along the pier. 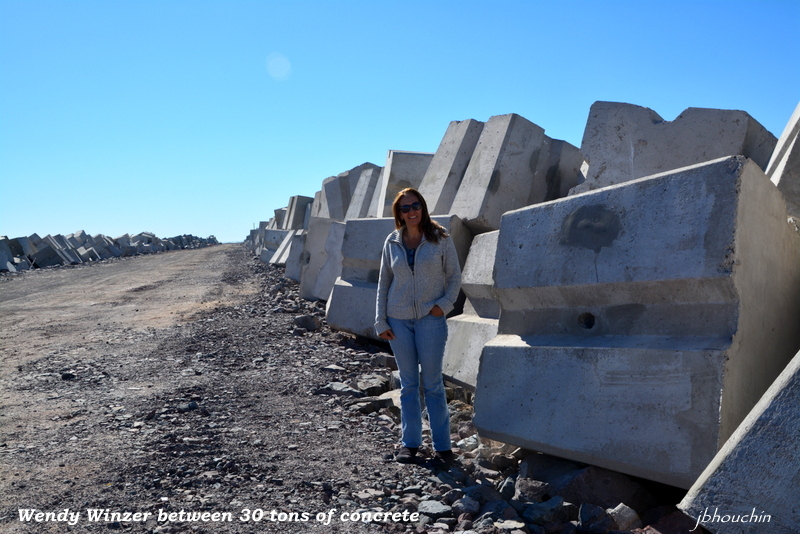 They will “plant” 140 of these giants and pump the precision-mixed concrete into them. They will eventually be covered with a roofing to protect the passenger building materials from the sun. The pouring of these columns is going to be quite a sight! In fact, it seems that every stage from this point, since they are dealing in objects weighing multiples of tons, will be an attention grabbing activity. Eric has kindly volunteered his photos for us to use and we look forward to the new ones for next month’s PART XII blog. Just in case you have wondered what will happen after our home port opens with one cruise passenger ship departing for a yet to be finalized itinerary around the Sea of Cortez; for example, you may wonder if one ship will make that much difference in our economy. That should be an easy one. We all know what an increase of 3,500 visitors arriving pretty much all at once upon our little pueblo can make to our economy (that's about how many passengers an average small cruise ship carries). The annual bike rally brings those kinds of tourists to town; Roger Clyne's fans hit that mark during his Circus Mexicus; Spring Break is yet another period that brings young visitors to town in large numbers. The answer, then, is yes, we do have somewhat of an idea of what an influx of 3,500 visitors all at once will have on our town. That is if we compare that influx with what we know from past experience, i.e. most of the visitors are repeat visitors, or they are traveling with repeat visitors, their stay will be from one to three nights, and they'll probably spend more money on alcoholic beverages and memorabilia than food while here, then Adios until next year. All growth has to start someplace, right? Even in the case of our home port, you have to think of growth in stages from beginning (easy to imagine words like "trickle", phrases like "small at first" and so on) to "mounting" to "accelerated" and then even to "critical mass". Well, to an extent, this is a good, reasonable, though traditional, way to look at how the cruise market will affect us economically in the beginning. But, wait just a moment. All those other slews of visitors with which we have experience arrive once a year. We have one whole year to think about it, plan for it, supply for it, hire for it, clean up after it, and get ready for next year's event. Cruise departures and itineraries are weekly...w e e k l y...WEEKLY! Aren't they? Well, no. These passengers who come to town at least the night before the cruise departs, average 1.5 days in the departure city before their cruise...and that's not all that needs to be factored in. What about the fact-and when talking cruise passenger facts, we get to deal with figures derived and proven through 40 years of meticulous study-that every passenger who leaves on a cruise returns to the same location either 7 days later or sometimes sooner. These factors add an entirely new dimension to what the impact of cruises add to a destination. We'll be delving into those in great detail in our future reports. Well, actually we didn't stroll the pier with Wendy Winzer, Project Administrator for the home port, this week. We met at the area you've surely noticed in the flatlands behind the resorts where the quad riders try to see how close they can come to breaking bones before wrecking their toys. Down here, each day a dozen cement trucks meet to pour a precise mixture of cement into imperfect (on purpose) squarish molds that will dry over night into one ton cubes and be stacked upon other cubes until approximately mid February when the project will begin hauling them to the pier to restart the building process that this time, at the specific request of the cruise lines, will include extending the length of the pier's first phase from 880 meters to 940 meters, then extend the second angle from 380 meters to 411 meters so it will reach water deep enough to handle docking of slightly larger cruise ships. In other words, the cruise lines are already addressing the fact that the growth of departures in the Sea of Cortez is obvious and imminent. We'll leave you with a few facts some of us-who've stood next to these "artificial" boulders thought nearly unbelievable: The smaller cubes weigh one ton each. It will take 73,000 of these to complete their job in making the pier. The larger cubes weigh in at 10 tons each and will be used on the outside (on the breakwater side) to reinforce the stability of the pier. Each cube is molded in such a way as to naturally fit snugly (if you can use the word "snug" in conjunction with a 10 ton concrete cube...) with the other cubes for a structure that will last many life times. The smaller rocks are still being pulled from the quarry and will be used for the inner structure before being packed in by the one ton cubes and later covered by the 10 tonners. 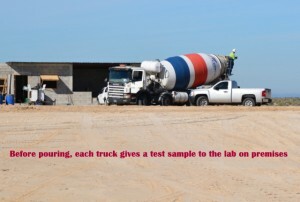 Each daily load of cement arriving in the mixers is tested as to consistency from which they can determine its projected lifetime under the salt water. There is a lot that goes into building a pier, and while to us, it may seem not much is happening, be assured that nothing has stopped behind the scenes, and it's all for our future and our safety! There is a lot more news for next month's edition of Part XI: Economic Impact of Home Port on Puerto Peñasco. 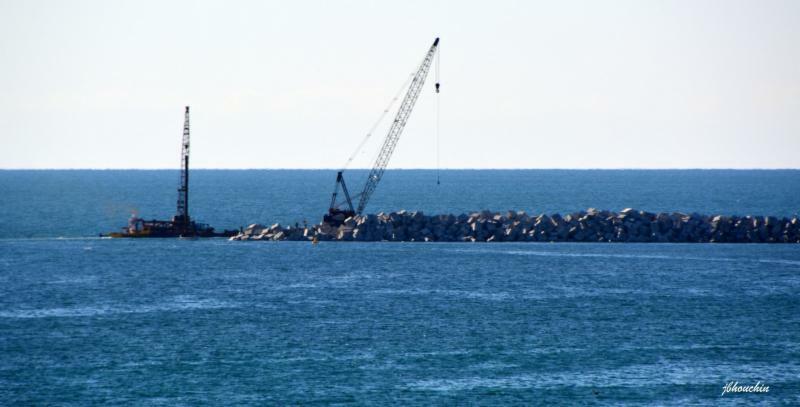 Work is moving forward as the stacks of blocks continue to grow and they are piled on top of each other in preparation of being transported to the port and positioned as needed to expand on the existing breakwater. Cement trucks running back and forth from the location is an almost constant activity and we have seen the hustle and bustle of workers every day right up through Christmas Eve and they were back at it the day after Christmas. Remember, this work is not happening at the pier itself. That will come soon enough, when they have enough of the blocks completed to begin transporting them to their final resting place as part of the Home Port. This work is being done in the large open space to the North across the road from the Sonoran Sun Resort. If you take the old road to Cholla Bay (extension of the new road past the Convention Center) you will drive right by the site. Be careful if driving down that way as there really are cement trucks flying back and forth at all hours, even past sundown. They are building a permanent structure on the site as well but I have not confirmed exactly how that structure will be used. I'm assuming that by next month's newsletter, I will have more information to share. For now, we can all just sit back and watch as the project moves forward. The Secretary of the Environment and Natural Resources (Semarnat) has assigned beach area of the Federal Maritime Land Zone and Land Reclaimed from the Sea (Zofemat) to the Sonoran State Tourism Commission (COFETUR). 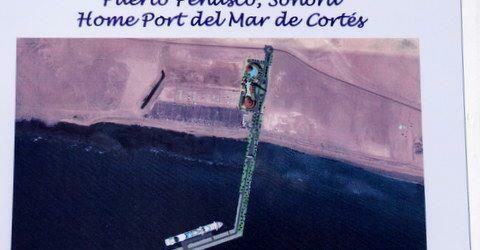 This area represents that corresponding to where the cruise ship Home Port is currently being built in Puerto Peñasco. This designation was established in an agreement published on Dec. 10, 2014 in the Official Journal of the Federation, detailing use by COFETUR of 3,470.92 sq. meters located at kilometer 3.7 of Sandy Beach in this municipality, for a breakwater to the east and to the west a cruise ship terminal and pedestrian walkway. The agreement published in the Official Journal, signed by Semarnat Director Juan José Guerra Abud, details the designation was made as the area meets official demarcation, under code No. DDPIF/SON/2009, dated October, 2009. 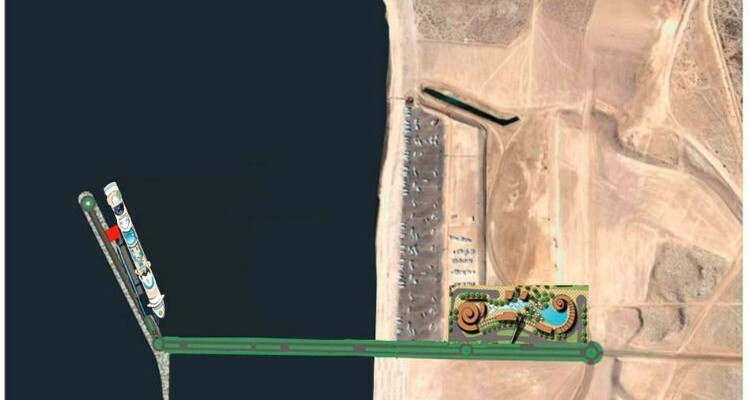 In addition, the Sonoran Tourism Commission, through a request dated July 28, 2014, solicited use of the area described above for use of a breakwater and cruise ship terminal with pedestrian walkway. Furthermore, on May 28, 2013, the Puerto Peñasco Office of Urban Development, Public Projects, Ecology, and Zofemat issued an acknowledgment accrediting compatibility for use of soil for the request made by the Sonoran Tourism Commission. Environments and the Office of Demarcation, Registry, and Fiscal Instruments, the General Office of the Federal Maritime Land Zone and Coastal Environments determined the request of the Sonoran Tourism Commission meets technical and environmental guidelines as required under the law in effect. Therefore, and based on provisions of the General Law of National Assets, federal goals are being met to provide optimum use of federal property by granting federal, state, and municipal public offices with properties as required to address public services in as much as possible. The Official publication details that an area of 3,470.92 sq. 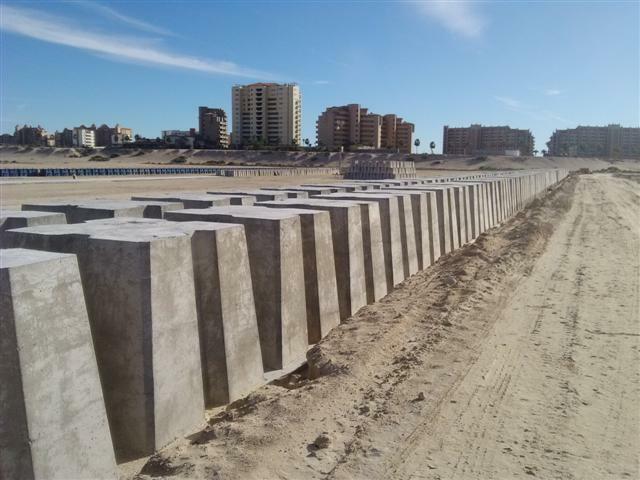 meters of beach in the federal maritime land zone and land reclaimed from the sea at kilometer 3.7 on Sandy Beach in the municipality of Puerto Peñasco is granted to the service of the Sonoran Tourism Commission for use to launch a breakwater to the east and cruise ship terminal and pedestrian walkway to the west. It clarifies this agreement only confers the Sonoran Tourism Commission the right to use the area for fulfillment of the objective indicated in the first article of said instrument, but does not transfer the property nor create any real right in favor of the Commission. The Secretary of the Environment and Natural Resources cites it may once again demarcate the area at any time, therefore coordinates of the vertex, directions and distances of the polygons may be modified. Environment and Natural Resources, or cease to use or need it, said asset along with all its improvements and accessions would be removed from its service in order to be managed by Semarnat. The official agreement issued on Nov. 5, 2014, also indicates within the attributes of the Secretary of the Environment and Natural Resources is that of strictly monitoring compliance with the same. The agreement itself was to enter into effect on the day following publication in the Official Journal of the Federation, which occurred on December 10th. "I went to the block making facility today on my way back from a project in La Cholla. Arturo (chief of security) kindly explained to me that the company building the Port Blocks is a specialty company from Monterrey, Nuevo Leon, Mex. They have built ports pretty much everywhere in Mexico and around the globe. They know what they are doing. Management is from Monterrey, several dozen from what I gathered. However 60 + people working on this project are from Peñasco. I asked bluntly....."are they being paid a dignified wage?" His reply was quick....yes! After a probationary period their wage is set according to their work ethics. If they are found lacking they are cut loose." "So far they have produced 300-350 large building blocks, and another 600-800 decorative blocks - the center will be filled with the blastings from Black Mountain. 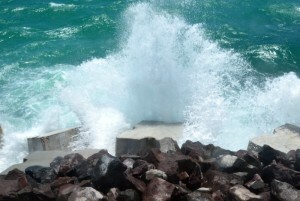 The blocks are constructed to allow water to flow freely from one side of the jetty to the other." "From what I see it looks like a great project with direct benefit to the people here in Peñasco. That's the construction side. The other side, the business side, I don't pretend to know who the players are. I have heard that these new ships will be brand new cruisers - flagged in Mexico and small - like 1500 passengers. If they are smart they will do what they can to make this whole multi million dollar project work. The whole thing can be built and the whole thing can fall apart in the interim with jackasses who want everything their way.....We don't know that right now. What we have is a successful project being done beyond first world standards in a ( dare I say it) second world theater with a few naysayers hoping for disaster, which I for one do not perceive." 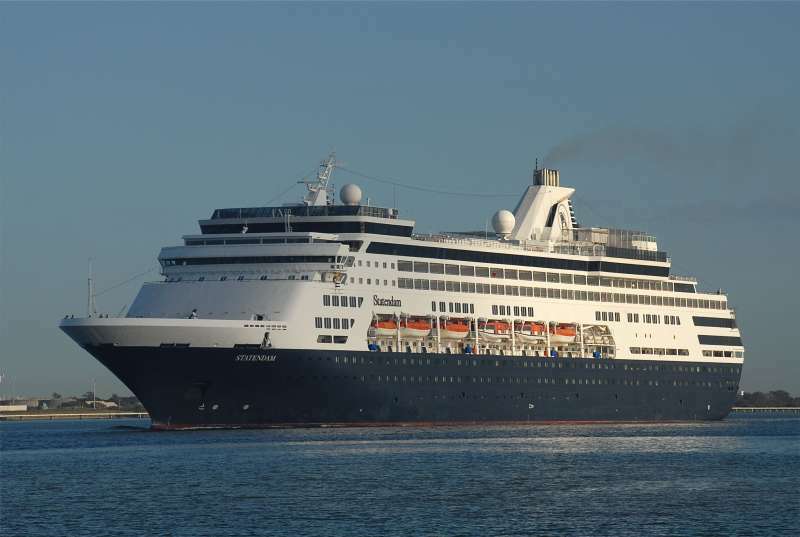 On December 8th, the Statendam of Holland America cruise line arrived in Guaymas, Sonora carrying 1,258 tourists and 560 crew members. This is the second time the Statendam has made its way to Guaymas, and expectations are for such dockings to provide an economic boost to the area of over 1.5 million pesos. Homero Ríos Murrieta, Deputy Coordinator of Sonoran Tourism (COFETUR), welcomed the tourists as they disembarked from the ship, which had most recently come from Loreto, Baja California, with upcoming stops in Mazatlán and Puerto Vallarta. It is estimated about 60% of cruise goers disembark at the Guaymas stop in order to see the city, eat, as well as to buy local souvenirs and art. This, explained the state official, represents an economic influx of over 1.5 million pesos. Cruise goers on the Statendam began their travels in San Diego, CA, with stops in Los Cabos, La Paz and Loreto, Baja California Sur before arriving in Guaymas. The COFETUR representatives expressed they are pleased as steps taken by Governor Guillermo Padrés with cruise lines have been successful. Cruise lines are becoming more confident in Sonora and traveling through the Sea of Cortez. During the present State administration, 11 cruise ships have made their way to Guaymas, representing an economic impact to date of 17 million pesos, detailed Ríos Murrieta. He added in the coming year the Sonoran Government would continue working with cruise lines to promote the Sea of Cortez route, or rather to ensure arrival in Guaymas, as well as to Puerto Peñasco where the Home Port is currently under construction. After a hiatus of a few months (to be fair, most of that time did have work going on behind the scenes), the Home Port project has picked up again. We all know that if you can't see something, it can't be real, right? So it is great to actually see some activity again to help raise the excitement levels. Although the project has not been without challenges and setbacks, everyone involved assures us that it will be completed, if only a bit later than originally planned. The current projection is to have it ready for one cruise ship by the end of 2015. That is a pretty ambitious goal and, personally, I expect it to take a bit longer, but here's to hoping that it happens sooner than later and without further hitches. If you are wondering what caused the delays in the first place, there were actually multiple issues. Some could possibly have been foreseen or avoided and some, not so much. There were union disputes, a misunderstanding with the contractor, political and environmental pressures, and probably most importantly, a problem with producing the correct size and integrity of rock from the quarry. Any project of this size is sure to have a few glitches and while the project may have appeared completely dormant, there was actually much activity going on behind the scenes working with engineers, geologists, conservationists, and the Government to form the new plan and obtain all of the necessary approvals. It looks like they are finally ready. 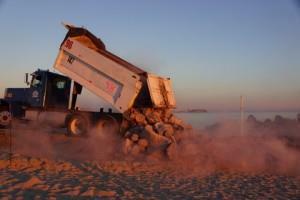 This is not the first ambitious project in Rocky Point to have had a few setbacks and delays. And, as I remember it, there was a ton of misinformation, some wild rumors, and loads of naysayers at those times as well. The projects that I am referring to are the Coastal Highway, the International Airport, and the Convention Center. Guess what? They have all been completed. Only time will tell if this endeavor will come to fruition or not but my money says that it will. 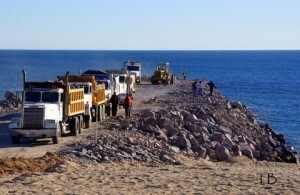 I don't know that there won't be more problems or delays before it is finished, but the vast majority of people who are "in the know" are confident that it will be finished and that it will be a great asset to Puerto Penasco. First of all, the word about using concrete blocks (cubes) is completely true. The large blocks (in place of the boulders) to line the outside of the base will be the most important use of the blocks, although small and medium sized blocks will also be used along with more of the small and medium sized rocks from the quarry (they have already started making more rocks). 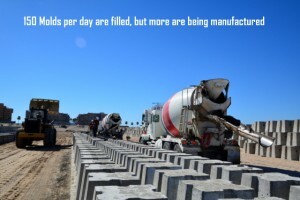 Concrete is more expensive than rock blasted from a quarry and this type of concrete is about 50% more expensive than normal concrete because of the special properties needed to withstand long term exposure to salt water. The new plan was presented to and accepted by the Federal and State Governments and they have reportedly agreed to the additional funds needed for the change. 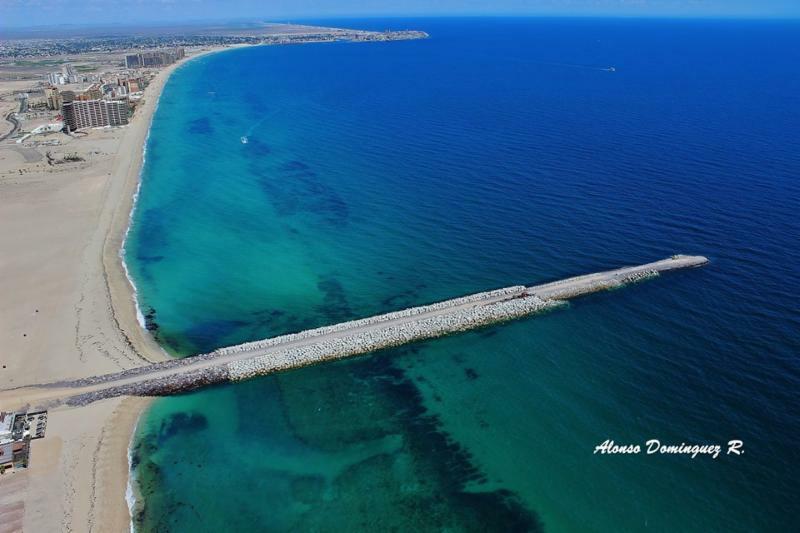 One way that they are compensating for the more expensive concrete is to extend the pier by an additional 100 meters in length. In order to achieve the needed depth, the original plan was to dredge around the last part of the pier. 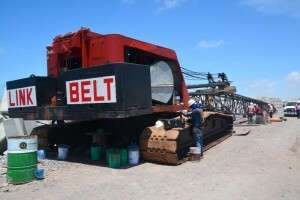 Since dredging is very expensive, it has been determined that extending the length will save money and compensate for some of the increased costs of using concrete instead of rock for the biggest barriers. Building (pouring?) 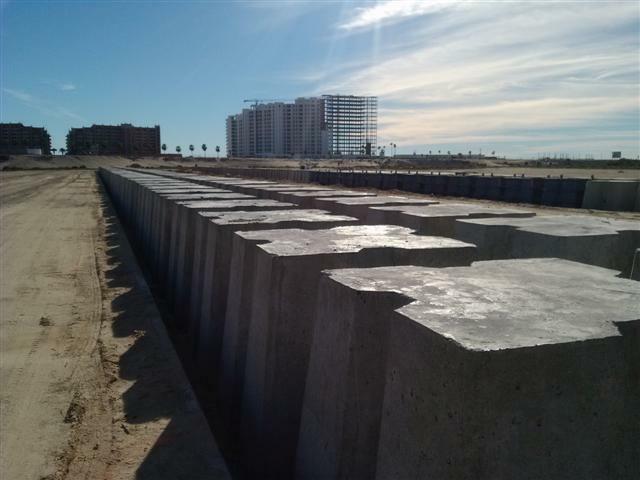 the concrete blocks will happen on a piece of the desert to the North of the Sonoran Sun Resort. If you look North from Sandy Beach Road towards the distant mountain, you can already see the site being prepared for a Cemex plant where they will be made. The forms are currently being built and the pieces are in place to start making them very soon. The estimate is that they will pour over 200,000 cubic meters of concrete to make enough blocks to finish the pier - about the same amount of concrete as used in the Dallas Cowboys Stadium. Another exciting development is that the construction of the first terminal and the boarding dock will begin very soon as well. They will now have a 3 phase process going at the same time with the breakwater, the terminal, and the boarding dock happening together. The terminal will be North of the existing buildings so there will be no need to close Wrecked or Mare Blu during its construction. By the way, there has been some confusion about whether the current breakwater is the actual pier or if there would be a pier built next to the breakwater. The answer is that what you see is the pier. It will be totally stable and will be paved when it reaches the required length. Fun Fact: The base at the end of the pier will be about 150 meters wide (that is over 1.5 football fields). It really is a pyramid with most of it underwater. Hopefully, this will put some of the rumors to rest and get people excited again. I know that seeing is believing so keep your eyes open because I think that you will see some real progress as we move into the new year. Click on the photo below to visit our YouTube channel. Remember to "thumbs up" and to subscribe and receive our updates! Our goal over the course of these series is to provide as thorough an understanding of this unique and lucrative market, known affectionately as “cruisers”, as possible. Each Part of our monthly series will either delve more deeply into impact areas introduced in the last installment, or introduce a new area of critical importance to maximizing the positive impact of the homeport on our economy. To summarize the cruise passenger mindset from what the industry has learned and on which the industry stays über current: A spoiled passenger is a satisfied passenger, which makes for a repeat passenger. Simple enough, right? The simple answer is, yes, it is a simple formula. Over the course of these impact studies, we’ll show examples of how crucial aspects of such a simple formula can be lost in the excitement and anticipation of all the obvious economic benefits that a cruise ship brings to destinations.